"Scaled Way Up features heavy doses of Galaxy, Mosaic, and Nelson Sauvin in multiple dry hops. Straddling the aromatic line between dank/earthy and sweet/fruity. The flavor profile is jammy and fruit forward, consisting of candied peach and orange notes, and has powerful, sticky resin on the palate. Light in body with a bold bitterness upfront and crisp, bone-dry finish, Scaled Way Up is explosively aromatic." From what I read, Trillium's newest release is an imperial version of Trillium's Scaled IPA, but just cranked up a few notches. I have not formally reviewed Scaled, but I have had DDH Scaled, which was excellent. Can the bar possibly be set any higher with this version? The appearance is classic Trillium with the unfiltered, murky dark yellow with two fingers of bright white head. Like me, it's ugly, but you love it. Lots of grapefruit, white wine, and orange sherbet on the nose along with dank hop juice, cedar, and black pepper. Complex as all hell. Immediately on the taste I am hit with a flavor similar to pulpy orange juice and acidic grapefruit, but it switches over to some of that orange sherbet from the aroma. The sherbet isn't as big on the taste as it was on the nose, but it's still here to be had. Some really nice and flavorful dankness from the hops overtake the middle of the mouth along with cracked black pepper which adds a nice kick of spice. It's nice and bitter heading to the back end and the abundance of hops are just a kick in the face. Right before the finish, the bitterness turns on a dime and I am left with a lot of white grape and sparkling white wine. The way the hop juice was going towards the finish, I was expecting a bitter end, but the sudden burst of refreshing fruits were a delight. Mouthfell is creamy and full-bodied. The hops never weighed me down and there was no trace of that 8.0% abv. It's incredibly drinkable and you will kill your 750ml bottle in no time, so just be careful. 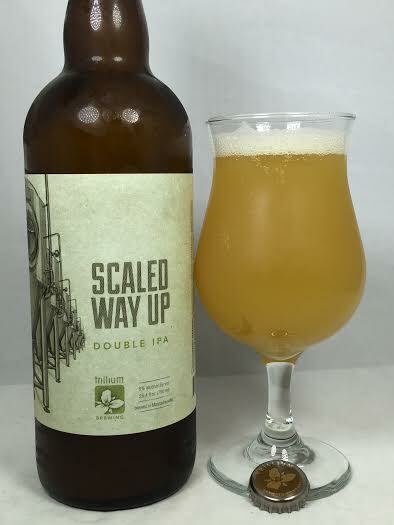 Scaled Way Up is another triumph for Trillium (say that 34 times fast!). Every hop varietal contributes big time and it is just so smooth and drinkable. As usual, I have a hard time finding something negative to say about a Trillium IPA and this is no exception. Stellar as always.